A webhook is a system used by an application to send information to other applications in real time. 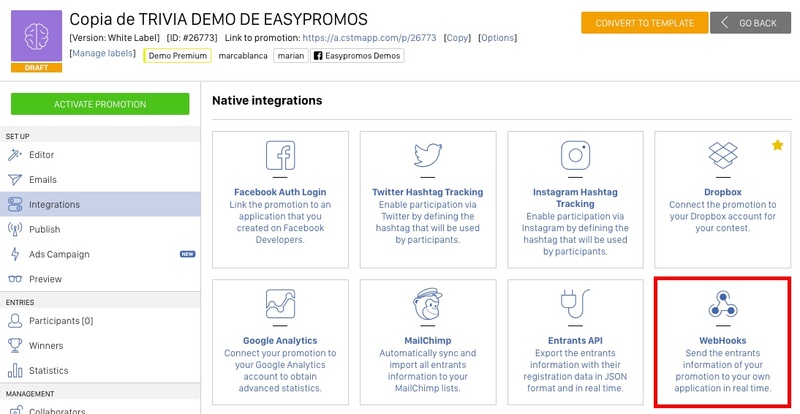 In Easypromos, webhook integration enables you to send registration data from your promotion participants to your own application in real time. You can then use your application to manage and manipulate the data according to your needs. NOTE: Webhook integration is only available for promotions created with the White Label version of the platform. Below, we outline the benefits of webhook integration and explain how to configure this feature in your promotions. What can you do with webhook integration? Send the registration details which have been collected from your promotion to an application external to Easypromos. For example, you could link the promotion database to your own CRM system. Gather information from a number of promotions into the same application. For example, feed a microsite with photos and entries from all your contests. Webhooks integration is an advanced feature and so a developer or someone with advanced programming knowledge will be needed to implement it. You will also need a server that accepts POST calls, and a way to write a script that performs an action in response. Create a test URL with Request Bin to see how you’ll receive the data. 2. Next, click on the ‘Webhooks’ image to enable integration. a) Webhook URL: This is the URL you’d like the data of your promotion participants to be posted to. If you don’t have a callback URL, speak to your developer or ask an expert to set one up. To classify and distinguish between different promotions. For example, if you have webhook integration enabled in a number of promotions which are running simultaneously, the webhook key allows you to classify them in your application and distinguish between them more easily. Utilize the webhook key as a security code to verify that the call is being made by the Easypromos server. Our server will send all the information of participants who register in the application to the URL of the webhook following the POST request method. This is the name or reference that you’ve configured via the 'Webhook key' field in the webhook integration section of the Easypromos application. Can I carry out a test to preview how I’ll receive the information? Yes. You can test the behavior of your webhook before launching your promotion and receiving real registration data from participants. To do this, create a test URL with RequestBin. This will provide you with a preview, enabling you to see the format in which you’ll receive the information.